Anthracene glycosides are also known as anthracenosides. They are purgative in nature. On hydrolysis, they produce glycones like dianthrone, anthraquinone or anthrone. The sugars are arabinose, rhamnose or glucose. Anthraquinones (Fig. 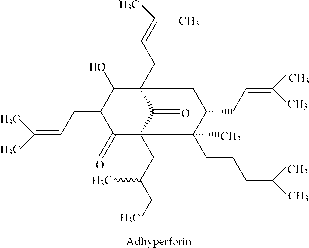 5.155) are the active constituents and are responsible for the biological activity of the anthracene glycoside containing drugs. In addition to use in treating constipation, they are used for the treatment of skin disease like psoriasis and ringworm (Fig. 5.156). Fig. 5.155 Structure of Anthraquinone. Fig. 5.156 Structure of common anthracene glycosides. Emodin, iso-emodin, aloe-emodin, and chrysophanol obtained from extracts of Cascara sargada, when administered separately, has little purgative effect. Yet the three given in admixture produces a good purgative action. Aloe-emodin inhibits cell proliferation and induces apoptosis in two human liver cancer cell lines, Hep G2 and Hep 3B (Fig. 5.157). Fig. 5.157 Structure of Aloe-emodin. Rhein, anthraquinione present in rhubarb, inhibited Hep G2 cell growth by inducing apoptosis and blocking cell cycle progression in G1 phase (Fig. 5.158). Fig. 5.158 Structure of Rhein. Aloin from Aloe vera is a mixture of barbaloin, fi-barbaloin and iso-barbaloin. Barbaloin is present in all varieties of aloe and is a crystalline, water soluble glycoside. p-barbaloin is amorphous and iso-barbaloin is crystalline isomeric glycoside. Anthraquinones including cordifoliol, cordifodiol and rubidian have been isolated from alcoholic extract of Rubia cordifolia. Rubidian has significant antioxidant activity. 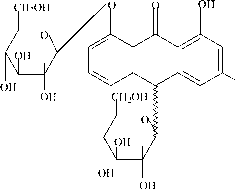 Morindin is anthraquinone glycoside present in Morinda pubescens. 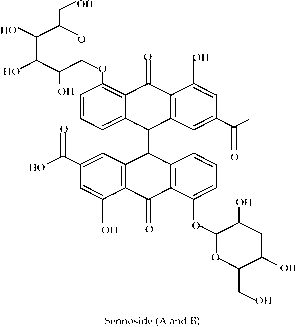 Peroxiscomicine, anthracenone from Karwinskia humboldtiana is cytotoxic to mamillian tumors. Damnacanthal obtained from Damnacanthus indicus and Morinda citrifolia is a potent and selective inhibiiter of P56 tyrosine kinase activity (Fig. 5.159) . It is also known to have antimalarial property. Fig. 5.159 Structure of Damnacanthal.